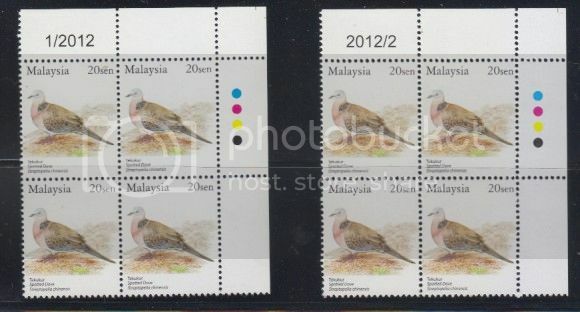 PSM Forum Welcomes you • View topic - birds 20s 1/2012?? and 2012/2 ?? birds 20s 1/2012?? and 2012/2 ?? Re: birds 20s 1/2012?? and 2012/2 ?? They may be printed in different countries - some countries use different date formats. lionheart wrote: They may be printed in different countries - some countries use different date formats. All current printings bear the watermark "SPM" of the local government printer. POS do use overseas printers but for special application stamps used in some commemoratives, but certainly not for definitives.